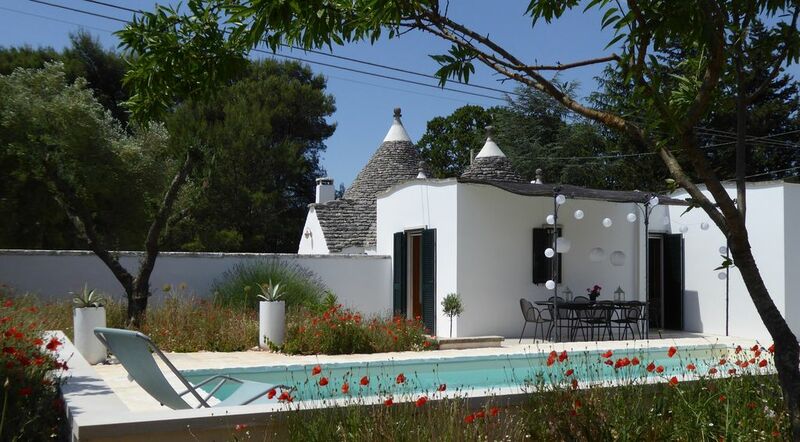 Trullo degli Uccelli is made up of a traditional trullo with an adjoining lamia/villa and a newly built swimming pool. The trullo’s thick walls keep it cool in the summer and warm in the winter; and always cosy and inviting in the evenings with its beautiful arches and lovely little alcoves. It has been lovingly restored, including unique mosaics inspired by churches in the local vicinity. The adjoining lamia, with it’s traditional curved ceilings, comprises of two double bedrooms, (one of which can be made in to two singles); a stunning and spacious bathroom and a utility room. Each of the bedrooms and the utility room have oak french doors which open onto a large terrace. With gorgeous views of classic Puglian countryside and its many olive trees, wild flowers and rich sienna-coloured soil, the sun-loungers and a parasol make it the perfect place to relax, and lanterns are provided for candlelit alfresco dining. The pool extends the patio and has elegant sun drenched steps to sit on, chat and soak up the sun. We are artists living in East Sussex but wishing we were in Puglia! Hannah makes mosaics (some of which are in the trullo) and Dominic is an animator. We fell instantly in love with Puglia on our first visit there in 2004 and Martina Franca in particular. It is a beautiful town which feels very 'real' and not at all touristy. The town itself is stunning, the people are charming and the food and wine are irresistible. Trulli are unique to this area of Puglia and are very special little houses with immense character. Our trullo is near enough to the town to enjoy its benefits but is set in peaceful countryside so you can really switch off and unwind. My mosaics make it particularly special and characterful and we have tried to think of everything you'll need and make it a real home from home. Large shower cubicle, wash basin, bidet, WC and heated towel rail. A gas bolier runs the central heating in the sleeping area, however this is only necessary in the winter. All linens are provided. For stays over a week a linen change can be carried out at no charge. Please let us know which day is convenient for the changeover. We now have a lovely new wifi set-up with unlimited usage and good speeds around the house and outside. Towels are provided both for bathroom and for the beach. For stays longer than a week a change of towels is offered free of charge halfway through your stay. The is a charming wood burning stove and a supply of wood. However, this is only available in the winter. There is a £50 surcharge for this. Traditional alcoved living space with a really comfortable double sofa-bed, armchair, extendable table and six chairs. A fresh welcome pack will be provided including fruit, bread and water, all chosen and sourced locally. Extensive supply of cookware, sharp knives and a wide variety of utensils. Abundant crockery, glasses and cutlery. A home from home. There is a basic portable cd/radio player and also speakers which you can attach to your own devices. A large range of cookery, local travel and italian language books as well as a selection of novels, many of which are italian themed! A wide variety of board games, cards and dice are provided for you to enjoy. There is also a simple table-tennis set, that can be attached to the kitchen table or in fact, any flat surface. There is a small selection of CDs for you to enjoy. There are many beach toys left by previous renters. A selection of DVDs are left in the trullo for you to enjoy. More a continuation of the rustic countryside than a traditional English garden. Full of wild flowers, Olive and fruit trees. A large terrace has an extending dining table for outside dining and game playing, under a pergola which provides dappled shade. 2 sun-loungers, 2 reclining chairs and a large parasol for sunbathing. A newly built 8m x 4m pool is situated next to the patio. Steps at one end run the full width of the pool, making it a gorgeous place to sit in the shallows and keep cool whilst enjoying the sun. Notes on accommodation: No smoking. To see more photographs of the surrounding area please visit our website (see below). Outside: Large terrace with a stylish pergola providing shade for the extendable wood/metal dining table and six chairs. Two comfortable sun-loungers, additional deck chairs and a large parasol. Utility Room: Washing machine, iron, ironing board, vacuum cleaner, hairdryer, local information, games and books. Cleaning / Towels / Linen / Maid service: Towels and linen are included and are changed once per week as standard. Additional cleaning is available on request at an agreed price. We had a wonderful week staying at this beautiful trullo. It has a lovely, comfortable feel and has everything you could need, from kitchen equipment to thorough maps and recommendations for the local area. It is perfectly located for visiting Puglia, from Lecce to Matera, and we will be back to visit again. We had a really wonderful stay at this trullo. It's very clean and well equipped with everything you need. The beds are comfy, the bedding and towels were regularly changed which was nice as the weather was so hot we were in the pool every day. The kitchen has everything, even proper sharp knives as another guest pointed out. There are all the basic ingredients to use, so cooking with the lovely fresh food we bought from the market or the shops is a joy. There are books and games to enjoy, and maps and local information so getting out and sightseeing is easy. There is so much to do in the area, so many restaurants and lovely beaches and towns. The maps and guide books were very useful. And the unicorn is enormous! From the start communications with Hannah were quick, clear and helpful. The trullo is easy to find, in a quiet location but not isolated and only 5 mins from Martina Franca. This was our first visit to Puglia and it certainly won't be our last. We would very much like to return to this lovely trullo again,as soon as possible! Thank you for your lovely review Helen, we are so pleased you had such a good holiday at our trullo. We’ve created a place we absolutely love to stay and it’s really nice when other people get to share it and enjoy all the things we love about the Trullo, Martina Franca, the food, the pool.....and of course, the unicorn! You’re welcome back anytime. We stayed here with our 2 young children ages 3.5 and 7.5yrs. From our initial enquiry to our return home the owners were so friendly and helpful. The property was fantastic with every need catered for. Reading the guest book you realise your are not alone in your appreciation of the effort and thought the owners have put in to make this holiday property stand out from the rest. It has a very relaxed, personal feel to it. The Trullo is in a rural location so a car is essential. Most beaches were approx. 45mins away and we visited both coast lines quite a few times! At weekends the beaches are packed so get there early although we loved being shoe horned in amongst the Italian family's! We only encountered a few English people so really felt like we were away! Martina Franca is 10mins away and offers a vibrant buzz in the evenings-we were lucky to catch quite a few live band performances and a stunning Flamenco singer too. We visited Martina Franca most evenings and every meal was simply superb although we did enjoy 1 or 2 BBQ's and dined al fresco lit by the many lanterns and fairy lights provided by the owners. The welcome pack is informative with restaurant recommendations and market days etc. Puglia offers many delights and we were able to sample quite a few of them whilst staying in this comfortable, relaxing property-stunning sea and coastlines, endless vineyards and olive groves set in sienna reach earth, historic basilicas and buildings and of course, the food, the wine, the coffee and the ice cream. Our children loved their 'holiday house' and still mention it! We all agreed it was our best holiday to date and felt thoroughly relaxed. Quite the most beautifully equipped rental that we have ever stayed in. Amazing attention to detail - it was just like home from home. Down to all the crockery and utensils ( that actually cut), including a lovely library of books for all ages! There are board games - just everything you can think of - we loved it. Unfortunately the weather was very unkind to us - however the Trullo was so comfortable and welcoming. We're so pleased you liked our trullo. When we started renting it we chose to make it somewhere we would love to stay, rather than provide just the minumum. For us, the details are what enhance a good holiday so we are thrilled you appreciated all the small touches. It's a real shame the weather wasn't kind to you; we wish we could control that! Puglia is normally so lovely, but every now and then there's a dodgy spell. Prachtige woning met veel privacy door omsloten tuin met vrij uitzicht en met een heerlijk zwembad! Wij waren hier 6 nachten op vakantie en we hebben er zeer van genoten. Een heerlijk huis met boeken, spelletjes etc., goede bedden, schoon en een prachtige tuin en zwembad. Voornamelijk buiten geleefd en vanuit deze woning is er veel te bekijken in de omgeving. Prachtige omgeving met mooie steden/plaatsjes en dichtbij beide kusten. De trullo met lamia had alles wat je voor een goede en comfortabele vakantie nodig hebt. Met gemiddeld 39 graden was het enige dagen in het huis te warm om echt goed in slaap te kunnen vallen omdat geen airco aanwezig is. Anders een prima verblijf, goede locatie en een oase aan rust. Super lekker eten in de nabije omgeving mogelijk (bijvoorbeeld Relais Villa San Martino in Martina Franca), maar keuken in huis ook super uitgerust om zelf een lekkere maaltijd te koken. We hebben iedere ochtend bij het zwembad ontbeten. Dat was heerlijk. We are situated 35km from both the Adriatic and the Ionian coasts. Part of Italy’s longest coastline, Puglia boasts some of the best beaches in Italy. Bari airport is 110km form the trullo and takes approximately 85 minutes to reach by car. Brindisi airport is 76km form the trullo and takes about 60 minutes to reach by car. Martina Franca is 3km away. Alberobello, Cisternino, Ceglie, Locorotondo and Ostuni are all within half an hour by car. Matera is about an hour away, and Lecce an hour and a half. Some of the finest food and wine in Italy comes from Puglia and the mozzarella alone is worth the trip! Booking Notes: A deposit of 25% is required upon booking. Balance payable 8 weeks before arrival date (plus a refundable £200 breakage deposit). Changeover Day: We are completely flexible with changeover days. We know how flight prices vary so will try to accomodate your request. . Departure time is before 10.00am and arrival time after 6.00pm. Notes on prices: Prices are for the property per week in UK Pounds. Prices are for 1-4 people, for 5-6 there is an additional charge of £100 per week. If renting in winter there is an additional surcharge of £100 per week for heating.